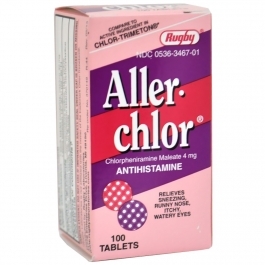 Aller-chlor, with active ingredient chlorpheniramine, is an antihistamine used in the treatment of allergies, including inhalant allergies (atopy). It can be used to ease itchy skin, rashes, and other signs of allergies.. If pregnant or breast-feeding,ask a health professional before use. Children 6 years to under 12 years of age - 1/2 tablet (break tablet in half) every 4 to 6 hours. Do not exceend 3 whole tablets in 24 hours.